Artisteer ($50 Home & Academic Edition, $130 Standard Edition; free demo of each) takes the concept of point-and-click Web design and runs with it, letting you create and customize unique WordPress themes without writing a single line of code. 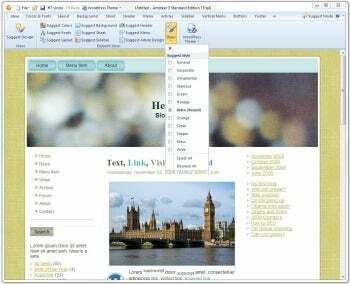 It can also export Blogger, Drupal, and Joomla themes, as well as raw HTML templates. Artisteer makes good use of the Ribbon style interface, subdividing the design process into sensible chunks. Artisteer makes good use of Microsoft's Ribbon interface, basing the entire workflow around it. The first tab is called "Ideas", and the first and largest button on that tab is called "Suggest Design." Click the button, and Artisteer generates a complete theme for whatever content management system you've selected for the current design project. I tested Artisteer with a WordPress project, and the resulting theme contained WordPress-specific elements such as a footer, a search box, and a post archive. You can click the Suggest Design button over and over, generating a different result every time. Themes come with different color schemes, background images, menu styles, header locations, and just about any other parameter that can be customized. If there's one particular style of theme you're trying to pin down, you can click the Styles button and place a checkmark only next to that style ("Retro" or "Grunge," for example). Once the Suggest Design button comes up with a design that looks about right, it's time to start drilling down and customizing specific theme elements. The different tabs on the ribbon are arranged according to how much they impact the design: The more general a tab is, the closer it is to the left. Thanks to this sensible arrangement, you can use the Ribbon as a sort of a Wizard interface, moving from left to right until you've gone through all of the available theme elements. For example, the second tab is Colors & Fonts. Once you're happy with those, you can continue to the Layout tab, then to the Background tab, and so on. Alternatively, if there's one particular thing you'd like to tweak, you can just click it in Artisteer's main window area. For example, clicking the template's header area activates the Header tab on the Ribbon. Each tab contains its own Suggest button, so you can quickly go through a bunch of designs for that particular element until you find something you like. If you already know what you're looking for, you can just select the settings you're after. You can directly control positioning, background image and color, alignment, and more. Even though Artisteer lets you customize everything about a design, it is oriented at standard blogs. For all its power, it still doesn't let you create every imaginable type of template. For example, if you want a WordPress theme that greets the visitor with a large grid of inviting photos (like some gallery templates), you would have to design it using some other tool, or go with an existing Premium theme from a site such as Woothemes. As long as your content follows a traditional blog layout, Artisteer allows for an impressive degree of customization and lets you go into the details only as much as you want to.